Karachi, once known as the city of lights, is now known for the overcrowded, unwanted, unsystematic settlements. All across the city walls, hateful racial and misogynist messages, commercial hoarding boards and above all political slogans can be seen which are nothing but a visual assault. In a bid to bring Karachi back to its days of glory, Daraz.pk sponsored a group of artists, going by the name of Abdoz Arts, to execute their idea to cleanse political and other hateful graffiti from the walls of Karachi University at the university’s annual carnival which saw over 27,000 visitors. The young artists have a vision to embellish the city with murals and generate a vibe of joy through refreshing colors of art. There has been a lack of patronage for these group of artists, hindering artistic outreach and Daraz.pk has tried to bridge the gap. “Abdoz Arts, founded by myself and Umer Asim, is a protest against the derogatory wall chalking on public walls in the form of beautiful artwork. Our aim is to free and reclaim public walls which we believe are an asset to the country and not a liability. Daraz.pk, which we believe is a brand of youth, was the first brand to honour our cause by supporting us in beautifying Karachi University's walls at the event, Art of KU” said Humble Tariq, co-founder of Abdoz Arts. Besides adornment of the city, another incentive Daraz had in mind was to promote Abdoz Arts in painting the walls in varying themes, from the comical to the surreal, touching on issues of education, pollution and social awareness. The project hopes to bring reflections of the whole country to the city by developing the murals as a mirror image of the prevalent society. 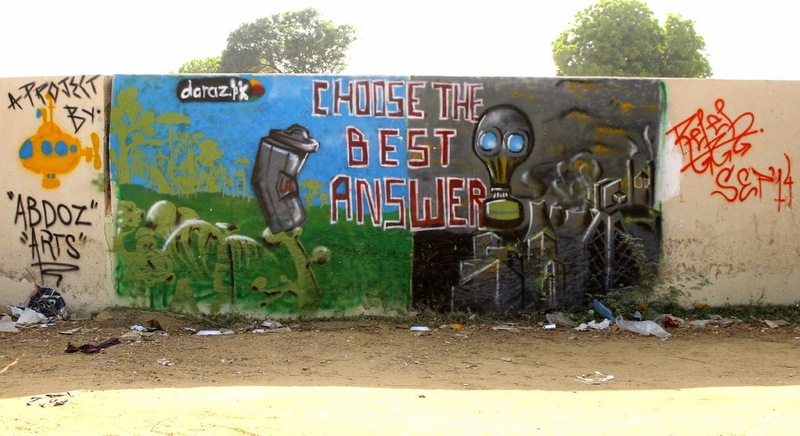 The walls painted in Karachi University aim to discourage pollution and each subsequent city wall painted by Abdoz Arts in the future will in some way project some critical issue faced by the country, in an attempt to make the artwork more meaningful. create art in public for the public, and the young artists worked as a catalyst to spread awareness regarding pressing issues. This initiative will revive the art values of Karachi and simultaneously create meaningful art in public places that are being misused. The artwork will be a source of inspiration to the onlooker and bring attention to many issues depicted in the paintings. It’s an attempt to transform the public spaces from one of debris and decay to one of inspiration and beauty.